Little convincing is the assumption made shortly after WWII, that the “shift” to the severe winter conditions of 1939/40 was caused by a sudden build-up of a cyclone off the Lofoten on 20th December 1939 (Rodewald, 1948). COMMENT: The usually moderate winter conditions in Northern Europe depend on the high heat supply from the Gulf Current (Norwegian Current), and the North and Baltic Sea. 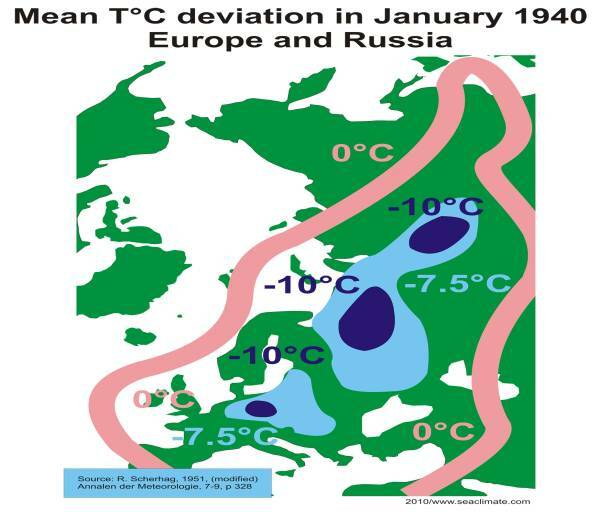 In January 1940 the heat supply was obviously to low to prevent a months with temperatures up to 10° C below the average, a clear indication of the role naval activities had on the marine environment during the previous four months.